Lee Jackson Maps - Caricature of Napoleon as First Consul. London, H.G.Bohn, 1851. Etching, 260 x 365mm. Coloured. Trimmed from a larger sheet. Having made himself First Consul of France Napoleon's imperial pretentions are being mocked. 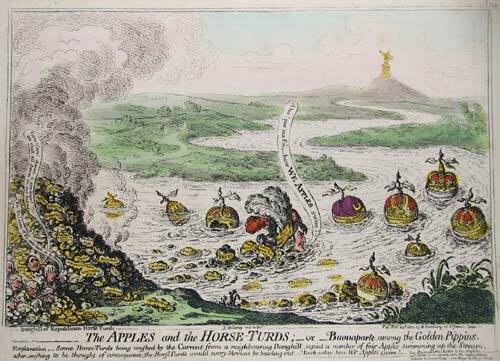 The apples are the monarchies of Europe, and he regards himslef as an apples, despite being swept from a French dungheap, with 'First Horse Turd' on his hat. First published 1800.